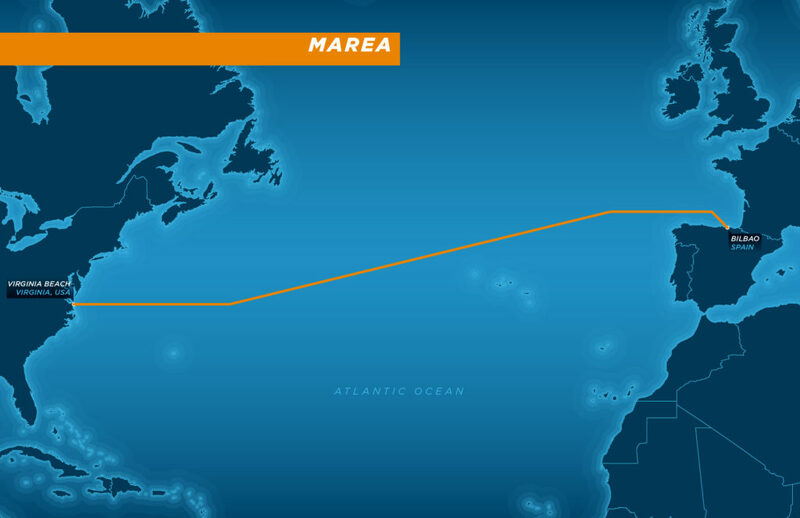 Facebook and Microsoft are laying a massive cable across the middle of the Atlantic. Dubbed MAREA—Spanish for “tide”—this giant underwater cable will stretch from Virginia to Bilbao, Spain, shuttling digital data across 6,600 kilometers of ocean. Providing up to 160 terabits per second of bandwidth—about 16 million times the bandwidth of your home Internet connection—it will allow the two tech titans to more efficiently move enormous amounts of information between the many computer data centers and network hubs that underpin their popular online services. “If you look at the cable systems across the Atlantic, a majority land in the Northeast somewhere,” says Najam Ahmad, Facebook’s vice president of network engineering. The project expands the increasingly enormous computer networks now being built by the giants of the Internet as they assume a role traditionally played by telecom companies. Google has invested in two undersea cables that stretch from the West Coast of the United States to Japan, another that connects the US and Brazil, and a network of cables that connect various parts of Asia. Rather than just leasing bandwidth on undersea cables and terrestrial connections operated by telecoms, the likes of Google, Facebook, and Microsoft are building their own networking infrastructure both on land and across the seas. The fact that these Internet giants are laying their own cables—at their own expense—shows just how much data these giants must move. Consider the services they run: Google offers its eponymous search engine, Gmail, Google Docs, Google Maps, and so many more. Microsoft offers Bing, Office365, and its Azure cloud services. Facebook has its social network along with Facebook Messenger, WhatsApp, and Instagram. The data moved by just a few online giants now dwarfs that of most others, so much so that, according to telecommunications research firm Telegeography, more than two thirds of the digital data moving across the Atlantic is traveling on private networks—namely networks operated by the likes of Google, Microsoft, and Facebook. That’s up from 10 percent just a few years ago. “It’s a tremendous change,” says Telegeography analyst Tim Stronge. Facebook, Microsoft and Telefónica have joined forces to lay fiber-optic cable across the Atlantic Ocean, the tech companies’ latest big-budget infrastructure project. 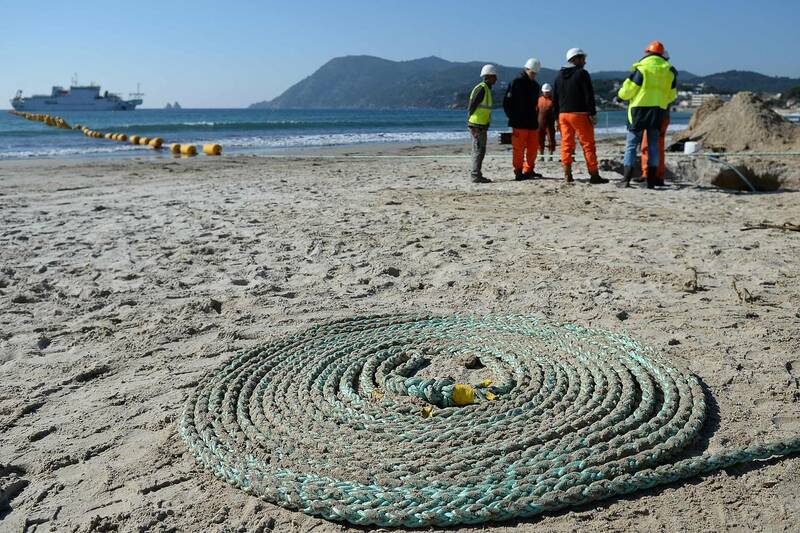 Above, rope is coiled in the foreground as a work crew in France installs a separate submarine cable in March. With so much data flowing across their systems, these companies are scrambling to build new infrastructure. In addition to building its own undersea cable, Facebook is buying up what’s called “dark fiber”—unused terrestrial cables—so that it can control how its data moves from place to place and move it more efficiently. According to Ahmad, Facebook is now using dark fiber “pretty much everywhere” as the company expands its network into new regions. And the same likely goes for Google and Microsoft. “We’re starting to see more of the large Internet content providers looking to build more of their own networks—whether they are leasing dark fiber or laying down new cables to build new routes,” says Michael Murphy, president and CEO of telecom consultancy NEF. In the past, Facebook has joined consortia that operate other undersea cables—groups typically made up of telecom companies—but this project is different. Rather than letting a group build and control the cable—that is, rather than sharing lines with others—the company is laying its own dedicated lines and it has the power to use them however it sees fit. In the end, this allows Facebook to expand its online empire much quicker than in the past. “The consortium model is much slower than what we would like,” Ahmad says. Much the same applies to Microsoft. That said, the two Internet giants aren’t abandoning the telecom industry altogether. The pair have brought in another partner: Telxius, a subsidiary of Spanish telecom Telefónica. Telxius will operate the cable, and Facebook and Microsoft services will command most of its bandwidth. But Telxius will sell some capacity to other companies in need of trans-Atlantic connections. The location of the cable also suits the specific needs of Facebook and Microsoft. Myriad undersea cables connect North America with Europe, but they don’t typically originate in Virginia. Even though Northern Virginia has long served as a major hub for Internet data centers, including facilities used by Facebook as well as dedicated data centers built by Microsoft and Amazon, the data itself typically flows through cables anchored in the New York area. With MAREA, Facebook will be able to more efficiently move information not only from facilities in Virginia but from its Facebook-owned and -operated data center in Rutherford County, North Carolina. “To have a direct connection from Virginia lowers latency,” says Murphy—that is, the time it takes for data to flow from data centers to its ultimate destination. “And that probably provides better quality service.” Other companies are planning cables anchored in this same area, but MAREA will likely be the first. Construction is set to begin in August and completion is expected in October 2017. In connecting to Bilbao in Spain, Ahmad says, the cable will provide a more efficient path not only to Europe but to Africa, the Middle East, and even Asia. All three geographies are increasingly important to Facebook and other Internet giants as they seek new audiences and new sources of revenue. Spanning more than 1.5 billion people, the Facebook social network has saturated the US and European markets, so now the company must focus on new frontiers. And in many respects, that involves building new infrastructure. The project expands the increasingly enormous computer networks being built by the giants of the Internet. Facebook is also working to fashion all sorts of new hardware that more rapidly pushes the Internet into those parts of the world that don’t already have it, from solar-powered high-altitude drones to a new breed of wireless antenna. Rather than relying solely on the world’s telecoms and telecom hardware makers, the company is fashioning its own hardware. And in the hopes of pushing this gear into the market, it intends to open source the designs, freely sharing them with the rest of the world. A similar dynamic is at play with the new undersea cable. Rather than just use what the telecoms provide, the company is building on its own. And a key aspect of the project is that it’s free to use whatever equipment it pleases to plug into the cable. This isn’t necessarily the case with the consortium model. “You’re stuck with whatever system was built initially. And if there has to be an upgrade, all the partners in the consortium have to agree to that upgrade,” Ahmad says. In some ways, this eats into a market once controlled by the big telecoms. “It’s going to get interesting. Who is the real telecommunications provider?” Murphy says. Murphy compares this shift to how Amazon has gained greater and greater control of the infrastructure needed to ship physical packages from place to place, building its own distribution centers, launching its own fleet of trucks, and even exploring the possibility of delivering packages via drone. But it should also be said that the Facebooks and the Googles and the Microsofts aren’t taking existing business from the telecoms. They’re just taking potential business. “This does mean that telecoms are carrying somewhat less of the content provider traffic than they would in the past,” says Telegeography’s Stronge. When you consider that these Internet giants are also using their own dark fiber on land, the upshot is that they are, more and more, taking control of their own destiny. With its Fiber division, Google has even gone so far as to become an Internet service provider itself, laying down faster lines all the way to American homes. That means it can potentially control the length and breadth of the network, from you to its many data centers in many parts of the world, and back again. Google doesn’t quite control the entire path from its own data centers to everyone’s front doors. But that’s the direction it’s headed. And, well, so are Facebook and Microsoft.